Even though it has been snubbed by the Oscars this year, Drive - the “fairytale” stylishly directed by Danish director Nicolas Winding Refn - is still one of my top 5 favorite 2011 films. The movie (screenplay by Hossein Amini) is based on the 2005 James Sallis pulp-novel of the same name. 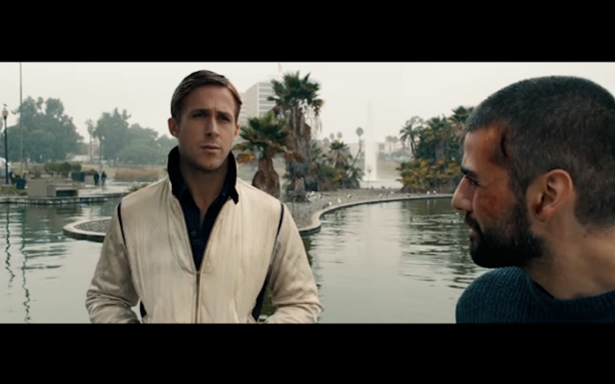 In addition to the understated, top-notch acting caliber of its two main stars Ryan Gosling and Carey Mulligan, Drive has another winning combination - its minimal but effective script, its pulsating Eurovision soundtrack of synth-based melodies, and its haunting film locations … showcasing the gritty, real-life neighborhoods of Los Angeles rarely mentioned in guide books. “It’s almost a mythological story, not a story about today or yesterday or tomorrow, so it was important that the movie have an almost indefinable time period,” states Newton Thomas Sigel, ASC, the movie’s director of photography in an intereview with American Cinematographer. Without further ado, let’s visit Refn’s Los Angeles. Here are 12 of the film locations featured inDrive. The film location used for the apartments where Driver (Gosling) and Irene (Mulligan) live are in the Los Angeles Park Plaza Hotel Apartments, located across from MacArthur Park. It was once an old hotel and has often been used as film locations for movies. Driver’s and Irene’s apartments were built from scratch to function like practical locations. 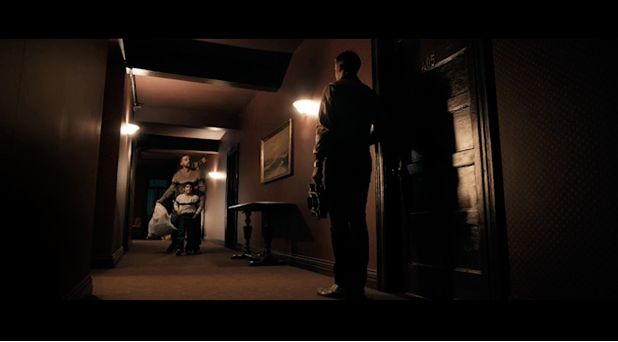 The film crew also placed a common hallway with doors opened into the actual apartment sets. Here’s Irene sitting in the hallway between her apartment and Driver’s. PHOTO CREDIT: Above photo is from Metromix Nashville. 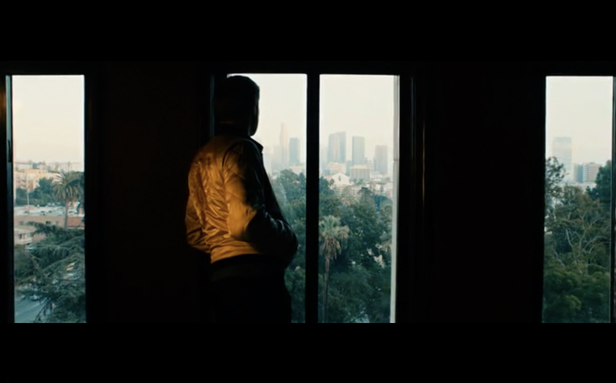 The set’s windows lined up with the Park Plaza’s real windows, providing a view of downtown L.A. Refn said the views of the park were the reasons why he chose the building. If you watch the movie carefully, you’ll notice that Driver’s window faces a sweeping view of Westlake Theatre and downtown. Here is the interior of Irene’s apartment. If you’ve seen Drive, you will forever remember the elevator scene. At one end of the corridor in the Park Plaza, the crew created an elevator set. To give the impression that the elevator was moving from one level to another, the art department redecorated the fourth floor hallway right outside the elevator to make it look like various different hallways from different floors. For scenes of the elevator open to the parking garage, the crew actually reconstructed the elevator set in the basement garage of the Los Angeles City Center Studios (film location of Mad Men coincidentally). At the beginning of the movie, Driver helps two robbers get away after a break-in at a huge electronic store. He then skillfully navigates the busy streets of L.A. at night, leaving far behind police cars and helicopter. He ends up at the crowded parking lot of the Staples Center and successfully blends into the crowd and disappears. The scene at the parking lot was filmed on location at the Staples Center. Driver saw his neighbor Irene and her son Benicio at a market in Echo Park. Her car stalls in the market’s parking lot and he gives them a ride home. That’s when their friendship begins. The market where the scene was filmed is a real local market called Big 6 Market, located a few blocks from Driver’s and Irene’s apartment building. Here’s Driver inside Big “6” Market when he spotted Irene and Benicio, shopping down the aisle. As he’s leaving the market, he saw that Irene’s car has broken down and offered her and Benicio a ride home. Driver juggles several jobs at once. By day, he’s a stunt driver for the movies and works at a garage owned by Shannon (Bryan Cranston). At night he drives getaway cars. Shannon’s garage is where Irene drops off her car after it breaks down and accepts a lift home from Driver. As he drives Irene and Benicio home after she drops off her car at his garage, Driver decides to take them to one of his favorite driving spots, along the concrete banks of the L.A. River. In the movie, this peaceful, golden afternoon (my favorite scene from Drive) is accompanied by the melodic, hypnotic tune A Real Hero. I could watch this scene over and over without getting tired of it. It’s quite magical. The racetrack in the Valley is where Shannon introduces Driver to Bernie for the first time. The film location is a former race track called Saugus Speedway. The park where Driver meets with Irene’s husband, a thug, and Blanche, a female accomplice (Christina Hendricks) is MacArthur Park (formerly Westlake Park). Built in the 1880s and named after General Douglas MacArthur, MacArthur Park is Los Angeles Historic Cultural Monument #100. Wilshire Boulevard splits the park in two. The southern portion has a lake, while the northern half has an amphitheatre, bandshell, soccer fields, and playground along with a city recreation center. Since the 1980s, MacArthur Park has been the scene for much gang violence. One of the most graphic scenes of the movie takes place at Nino’s Pizzeria where Nino (Ron Perlman) uses as his office. We’re first introduced to Nino’s Pizzeria when Shannon comes to ask Bernie Rose (Albert Brooks) to invest in Driver for car racing. The real life restaurant standing in for Nino’s Pizzeria is Vincenzo’s Pizza on Balboa Boulevard. Screenshot of Bryan Cranston as Shannon at Nino's Pizzeria. When Driver tries to help Irene’s husband Standard get out of an old debt, he agrees to drive the getaway car for pawn shop robbery. The pawn shop is actually a lodge off of the Sierra Highway in Santa Clarita. Since Refn and his crew had to shoot in the Valley area where the production hub was, the lodge was a perfect location for filming. “I had to be on the outskirts of the city, and I wanted that kind of hillside, blue sky, almost a Western feel to it. Not an urban environment.” said Refn. To make the lodge fit the scene, they added a sign to its exterior. One of the more violent scenes takes place in the motel where Driver and Blanche hide out after the pawn shop job goes south. Refn chose the Pink Motel to be the film location because of its dated, eye-catching interiors. The Pink Motel is no stranger to Hollywood. It has been the film locations for movies and TV series such as Dexter, The OC, and The Whole Ten Yards. “The motel was hard, because so much action goes on. It was called the Pink Motel, which has been used in a lot of movies. But I really liked the motel rooms, so I decided not to do any exterior shots so nobody could know where we were actually shooting,” shared Refn. “I’m very much a fetish filmmaker in the sense that I just shoot what I would like to see,” said Refn. 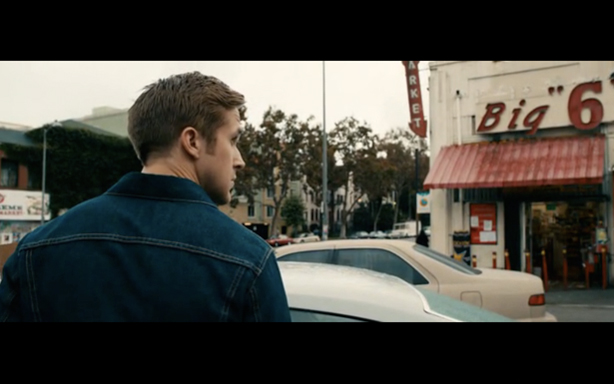 In this case, Drive - the coolest movie in 2011 - is Refn’s love letter to L.A. Here are a few behind-the-scene clips from Making Of and Daily Motion in which you can get a few glimpses of Drive‘s filming locations. Enjoy! For information on filming in California, visit the California Film Commission’s website. PHOTO CREDITS: All of the above images with black borders are screenshots taken from Drive.